All transactions are safe and secure with a reliable history in online purchasing behind each of our associates. 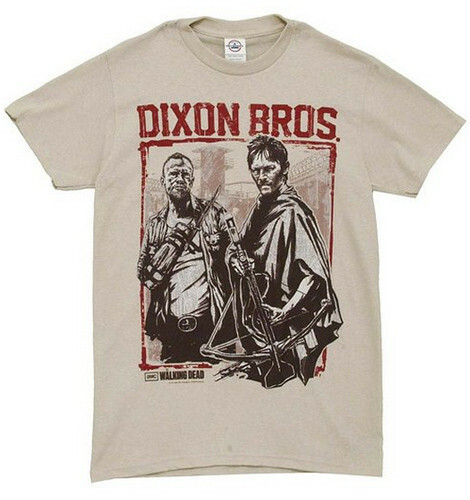 Buy The Walking Dead Dixon Bros. t-shirt to own Walking Dead clothing and merchandise. As Daryl and Merle Dixon try to survive the zombie apocalypse in The Walking Dead series on AMC, they don't express a whole lot of brotherly love. However, they are family and that means they're loyal to one another. This Dixon Bros. design is a tribute to the bond between them. If the artistry of it all makes your jaw drop like one of Michonne's captured walkers, then snag The Walking Dead tee today. Keep watching for more Dixon zombie slaying in upcoming episodes. In addition to The Walking Dead Dixon Bros. tee above, browse the Walking Dead Clothing Gallery for more apparel like men's and women's clothes, kids shirts or hoodies.